There are different types of concrete cutting blades available in the market, and the type of cutting blade you choose to use will depend on the depth of the concrete that you are cutting. Even though concrete cutting blades all serve the same purpose, some are durable and reliable for quality work than others. 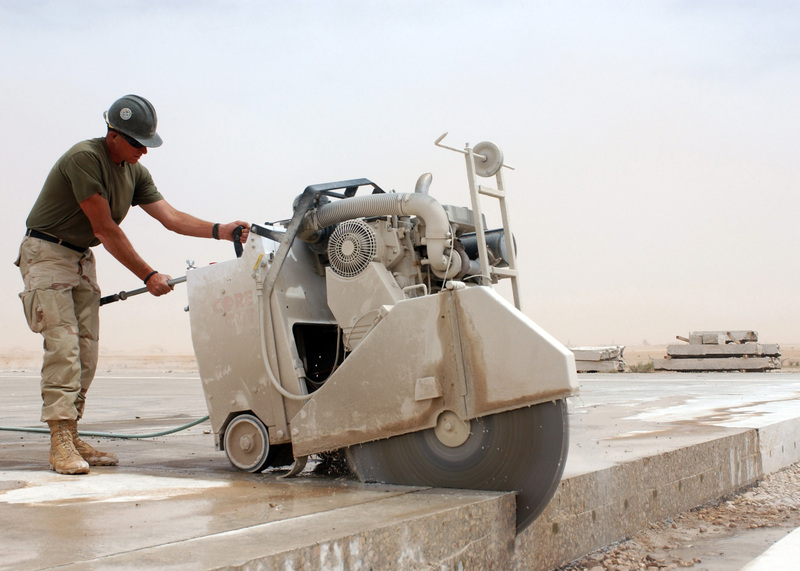 This article will discuss different types of concrete cutting blades that exist today. You will also understand why some of these blades are powerful than others and also when to use each type of blade. Turbo-rim blade is one of the common blades used to cut concrete. These diamond blades are designed with a serrated rim which cuts through rough and hard material such as concrete and bricks. Another reason why most professionals prefer to use this particular concrete cutting blade is that it is more aggressively than other brands which are designed with continuous rim blades. However, even though the turbo-rim blade is reliable for cutting concrete, it does not leave a smooth finish because of the serrated rim. Segmented blades usually rely on their diamond edges to cut through tough objects. Moreover, this particular blade is designed with a rim which is divided using gullets. Segmented blades are considered to be powerful and easy to use because of the segments that it possesses. Furthermore, these segments also cause the blade to cut through quickly than other types of blades meant for cutting concrete. Apart from cutting concrete, you can use this particular blade to cut other tough material such as bricks. Another type of blade use to cut concrete is the abrasive blades. You can also use the same blade to cut other materials that are hard such as bricks and even metal. However, you also need to understand that abrasive blades do not have segments or teeth like other types of blades meant for cutting concrete, but instead, they cut through tough materials using an abrasive material such as silicon carbide or aluminum oxide. A circular saw can be used with an abrasive blade or diamond to cut through tough objects such as concrete and bricks. However, it is advisable that you set the depth of the circular saw before you begin cutting. A circular saw does not only cut through concrete, but it also leaves a smooth finish. It is not easy to cut through concrete. Cutting chases in concrete or dismantling concrete is often necessary for improving the use of any working or living space. You may need to cut through walls, floors or other structures. This process of cutting concrete becomes much easier if the right blades are used with the equipment that facilitates the process. Blades are mounted on motors that impart a high torque and spinning force that enables the blades to bite into the concrete. They can be made of corundum or use diamond tips to give the necessary hardness that can cut the concrete. Corundum blades are used mainly for masonry, but can be utilized for cutting concrete of low strength or that which is green and has yet to achieve its strength. These blades are relatively cheap, but will require more effort and will wear out quickly. The cutting process creates a lot of dust and makes the edges very hot. Their economy comes from limited use where shallow cuts are required. Diamond saw blades are the most efficient in the cutting of concrete. These blades have a steel disk that has a rim that holds the diamonds. The diamonds are held in a metal bond that also wears away as the concrete is cut. The diamonds used in these blades are synthetic. The diamonds that are exposed at each segment of the cutting edge slice through the concrete, when the blades are rotated at high speeds. Blades can have hard metal bonds that ensure that the diamonds are thoroughly worn out before the blade becomes ineffective. These type of blades are used for cutting uncured or green concrete. Where the cutting is required to be done on hardened concrete, it is better to use blades that have a soft bond, so that the eroding diamonds continually expose newer diamonds in the matrix. Aggregate size and the type of sand used in the concrete can also have a bearing on the right blades that are needed for cutting concrete. Blades wear out faster when the aggregate size is small, though cuts will be easier to make. Larger aggregates take a longer time to cut through but are not so demanding on the diamonds. Crushed sand is more abrasive that river sand. High temperatures are generated during the cutting of concrete, and it is not uncommon to find cutting equipment that has facilities the cooling of blades with water during the cutting process. This water reduces dust and also extends the life of blades, as the blades remain cooler during the cutting. Concrete cutting blades must be selected depending on the material that has to be cut. This action can ensure economy and efficiency of the blades. These are the different types of concrete cutting blades available in the market. If you are planning cut your concrete using any of these tools, you might be required to buy the one that meets your needs or rent from a home improvement shop.